Manufactured homes financing is not different from financing block built homes. Let's start with your savings. You see, manufactured homes financing (or prefab home financing) is pretty straightforward when you have a sizable amount of money saved up in your account. building or portable home to you right on time. Yes, life is beautiful when you have plenty of cash saved up! The sad part is this . . . the majority of people in Nigeria don't have huge savings they can deploy towards buying the manufactured homes of their dreams. Consequently, the manufactured homes financing options open to them are options 2 & 3 above. That is, you can either secure home loans from one of the commercial or mortgage banks in Nigeria or look for independent home loan lenders. Since independent home loan lenders are not commonplace in Nigeria, the home buyer is stuck with commercial banks and mortgage institutions in Nigeria. The good news is this . . . you can easily secure a mortgage loan for manufactured home financing if you work for a high profile national or multinational company in Nigeria. All you have to do to kick-start the process is to visit your bank and request a loan application form. Then fill the form and provide the appropriate documentation required by the bank especially the letter from your employer to the number agreeing to the requirements by the bank. Here's one important thing you must not forget: Tell your account officer to print out the mortgage loan repayment schedule, which shows the monthly deductions from your earnings for the duration of the prefab home financing loan repayment. This gives you an idea what you monthly charges will be and what will be left of your salary. Naturally, if the deductions are beyond what you can comfortably bear, simply reduce the value of the loan you're requesting from the bank. That will automatically reduce your monthly repayment amount. What happens when you take a mortgage loan in Nigeria? The bank will generally ask you to make equity contribution towards the loan. In lay man's language, it means you will contribute a part of the money for the property you wish to buy while the bank will contribute the balance. For example, if you apply for a loan of 10 million Naira from your bank and your bank requires mortgage loan applicants to provide 30% equity contribution, then you will first pay 3 million Naira (that is, 30% of =N=10 million) to your bank before your bank will release 10 million Naira to you. Commercial banks in Nigeria only issues 70-80% of the loan applied for to home loan applicants. What if you do not have sufficient cash to put forward the equity contribution required by your bank? Simple. You won't get the loan. On the other hand, if you meet all mortgage loan applicant requirements (including paying the appropriate equity contribution to your bank), the bank will issue you the manufactured homes financing loan applied for. The bank will start deducting the repayment amount according to the loan repayment schedule given you at the outset. Yes, you got it right. Your bank won't waste time recouping the home loan given to you. In fact, the bank will start deducting the repayment amount from the very month they issued the loan to you. Prefab Home Financing - Pay In Installments! 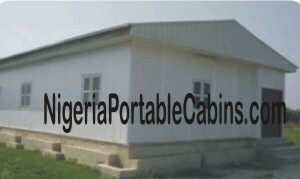 Erimama Investment Company Ltd (the owners of this site), the premium prefab homes and portable cabins company in Nigeria is pleased to announce our installmental payment option. With this option, you don't have to develop headache because of stress associated with securing loans for financing manufactured homes in Nigeria. Now you can pay at your own pace and still get the same great value prefab houses we manufacture. Remember, what happens when you take a home loan from a commercial bank? The bank gives you 70-80% of the property amount in advance so you can buy the house. And then they begin to deduct the amount back given to you from your monthly earnings. Don't forget: commercial banks in Nigeria charge 19-22% interest on the loans they give their customers. What happens when the customer is unable to complete the loan repayment as per the repayment schedule due to loss of employment or some other circumstances that limits his ability to pay the loan plus interest back in-full? The bank confiscate the property (in a foreclosure) and sells it off to recover the loan given to the defaulting customer. Taking a mortgage loan is a risk. You could win or you could lose. Remember, in every monthly loan situation, the bank rarely loses. Compare the commercial bank loans to the low risk option we offer our clients. We give our clients who wish to buy prefab homes but are unable to pay the full amount at once the option to pay over several months at their own pace. Over how many months can you pay? You can pay for your prefab home over a period of 12 months, 24 months, or 36 months. That is, over a period of 1,2, or 3years. This is manufactured homes financing made easy! Ready to become a home owner in Lagos Nigeria or any other part of Nigeria? Want to become a landlord at your own pace and time? Simply fill the form below to signup for our prefab home financing program and get a charge to pay for your home in easy-to-pay installments. P.S: The installmental payment option is for individuals only NOT for companies.